May 16 - 21 at the Merriam Theater! I'm really looking forward to seeing the Kimmel Center Broadway stage adaptation of Dirty Dancing, some movies are hard to picture going from the screen to live theater, but I think this one will lend itself. And great timing as the movie is celebrating it's 30th Anniversary! So sad we lost Patrick Swayze and Jennifer Grey's real nose since the musical romantic drama took the box office by storm back in 1987, and became a beloved favorite for subsequent generations. For me, it's not quite up there with Grease, Footloose or Fame, but it's still a nice guilty pleasure flick. Tinsel & Tine got a chance to interview one of the cast member,of this current touring production Jennifer Mealani Jones, who plays the role of Penny. Jones is a Philly graduate of University of the Arts, a former Philadanco dancer, and was a Phila.76er's 'Dream Team' dancer, so be sure to scroll past the contest to read our chat. Tinsel & Tine wants to know your feelings on Dirty Dancing, which by the way, will broadcast a remake on TV May 24th 8pm on ABC starring Abigail Breslin as Baby. FOR YOUR CHANCE TO WIN TICKETS to the Opening of Dirty Dancing the musical at The Merriam theater enter via Rafflecopter below, which links you to T&T's Facebook page to comment or Twitter to Tweet about the contest. (As always, please be sure after you make your comment on facebook, you then hit "I commented" on Rafflecopter or it won't register). T&T: I’m sure this is the question everyone has inquired about, but it must be asked, what’s your relationship to the 1987 “Dirty Dancing” movie: something you watched growing up on DVD often? You’d seen it before, but not one of your go to, feel good movies? Or something you watched once you got the role of Penny Johnson in this production? JMJ: I loved DIRTY DANCING as a kid. My Mom didn't really let me watch TV growing up so it was always a treat when I could catch a movie here and there, especially when it was a dance movie with a bad-boy stunner like Patrick Swayze - When I was cast in DIRTY DANCING, my friend shot me a text saying, "Remember when we were watching Dirty Dancing in college and you said 'Mannnnnn, I would do anything to go back in time and be one of those dirty dancers!' Look at you now." Dreams do come true. T&T: My sister runs the custom shop and teaches classes in Custom Design at the University of the Arts, so I’ve gotten a sense of the dedication of their theater department, can you sum up your experience at the school? JMJ: I spent most of my time in the dance department. Going to UArts for four years was the best thing I ever did. I went from a small-town life to living in a gritty, vivacious city and going to a University full of weirdos with a passion for art, just like me. I had instruction from the best teachers, more performing opportunities than I could have ever imagined, and I met people that became friends for life. It was a lot of work, a lot of joy, a little bit of pain, but overall an incredible four years. 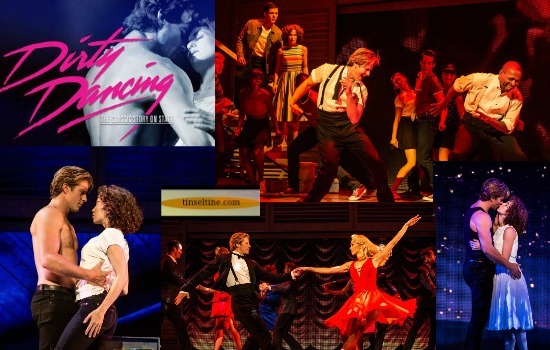 T&T: How long will you be in this current touring production of “Dirty Dancing”? What’s been the most fun part of the experience? If you could be in any show either currently or formerly on Broadway what would it be? JMJ: My final performance with DIRTY DANCING will be at the end of June. It's been an incredible year of touring with such talented and inspiring humans. The most fun part of this production has been performing in cities that I've never even heard of like Sioux Falls, SD or Fayetteville, AR. Those cities were so hip and so fun. - As far as Broadway shows? Any Fosse show. Put me in all of them! Let me do Sweet Charity! Chicago! Cabaret! I could go down the full list. Oh and West Side Story, of course. T&T: Philly is such a foodie town, I’m sure there are places you couldn’t wait to visit once you were back in the city. What are some of your favorite spots, anything from favorite Stephen Starr restaurant, to pizza and of course steak sandwiches, to best coffeehouse. JMJ: It's so hard to name just a few ! El Vez will be a priority. I'm going to stop by the spots I used to frequent like Varga Bar, Bru, Jose Pistolas, Silk City, Devil's Den, and Garage Bar. I'm hoping I can catch all my stunning Queens (Lady Poison, Iris Spectre, and Maria Top Cat. ILY!) at Frankie Bradleys. I'll definitely stop by Pats, Genos, Jims, AND Dalessandros. I love all of the La Colombe coffee roasters but I'm sure I'll have some new places to try. I can't wait to be back in the city! JENNIFER MEALANI JONES (Penny Johnson), an Ellicott City, MD native, started her dance career in Philadelphia, PA., where she graduated from the University of the Arts (BFA in Jazz Dance). While in Philly she performed with Philadanco, was featured on “So You Think You Can Dance” (Season 10), was an NBA 76ers Dream Team dancer and worked with the brilliant Gunnar Montana. In 2014 she moved to Los Angeles where she has danced and worked professionally on stage, in film and commercials. Jennifer is grateful for the love and support from her family and friends, and is thrilled to be starring as Penny on this tour of Dirty Dancing!